I had a lot of fun with music at school, with a really great music teacher - Roy Cooper. He introduced me to Jazz and Avante Guard music, and generally opened my eyes. The school orchestra had the weirdest combination of instruments you can imagine. 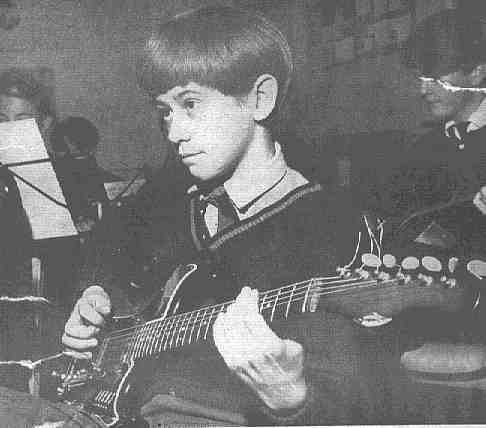 This is a photo which was taken for a 1966 issue of Teachers World - Secondary Education with me playing my newly acquired Burns electric guitar. After a couple of terms as a flautist at the Royal Manchester College of Music (as it was called then), I decided I wanted a more eclectic type of course so I left, to start at the University of York. I enjoyed this course much more and all my Avante Guard background at school was really useful. We also did stuff with Indian music and produced a Pop music album - and even got a degree at the end of it! After University I freelanced for while and kept my contemporary music interests alive with ensembles such as Dreamtiger, a London based contemporary music group. I also gave Arts council lecture/recitals during this time, and gave my Wigmore Hall debut in 1975. My work with Grimethorpe got me noticed by the newly formed James Shepherd Versatile Brass and after several guest jobs on recordings and concerts, I joined them in 1979 and stayed with them until 1985. We occasionally had some very famous guests with us! 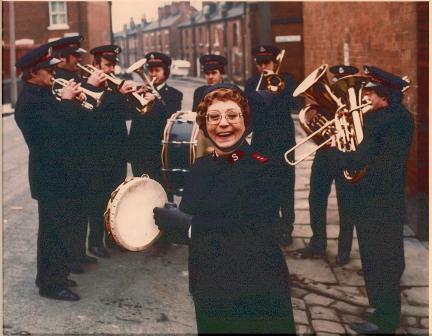 This was taken during filming for the Yorkshire Television comedy series "Hallelujah!" in which we appeared with this well known Dame. These were very happy times spent with some great players in some wonderful places. To be top of the bill in the Monte Carlo Sporting Club was a nerve racking experience. My Purcell Room debut was in 1985 with The James Shepherd Versatile Brass. One of the spin-off's from working with the group was to co-produce, along with Michael Hopkinson, an album of solos for James Shepherd. Jim has been one of this country's most highly respected and talented cornet players ever, and for this final album he wanted something special. I like to think we gave him just that - with some very varied arrangements and styles. As well as the arranging I kept busy playing drums, percussion, bass guitar, guitars, flute and Fender Rhodes on the album. In 1984 I gave the first performance of David Cox's Concerto for Percussion and Orchestra. Myself and percussionist Graham Hall were joined by the legendary James Blades and The East of England Orchestra in a day long percussion extravaganza, which culminated in Graham playing Milhaud's Percussion concerto and myself playing the Cox concerto. In 1985 I paid my first visit as tutor to the National Youth Brass Band of Switzerland and took with me a piece which they had commissioned me to write for them featuring the very fine percussion section. This was CANARIOS based on a theme by Gasper Sanz. This recording was made during the 1985 finale concert. I have since returned to Switzerland as a tutor, and also been percussion tutor on the Boosey and Hawkes "Open Music College" courses.